CHAPEL HILL, NC – The bacterium that causes the sexually transmitted disease gonorrhea is resistant to multiple standard antibiotics and now threatens to develop resistance against ceftriaxone, which is on the World Health Organization List of Essential Medicines and is the last effective antibiotic against the organism. UNC School of Medicine researchers have identified mutations to the bacterium Neisseria gonnorrhoeae that enable resistance to ceftriaxone that could lead to the global spread of ceftriaxone-resistant "superbug" strains. "The first step in stopping a drug-resistant bacterium is figuring out how it becomes resistant to antibiotics that once were able to kill it," said study co-senior author Robert Nicholas, PhD, professor and vice chair of UNC's Department of Pharmacology. "Our results give us clues to how ceftriaxone-resistant gonorrhea is emerging, why this is such a looming problem, and what to focus on to limit it." N. gonorrhoeae isn't yet widely resistant to ceftriaxone, but two isolates – H041 and F89 – have been shown to be fully resistant to the drug. 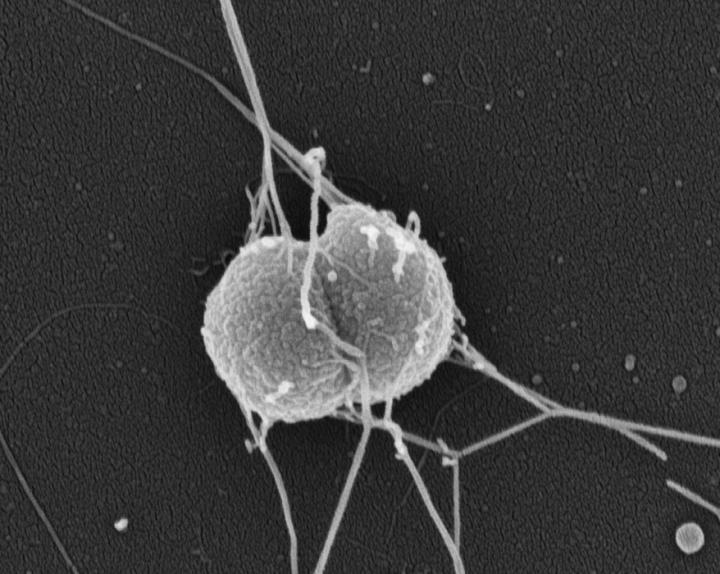 These cases have raised concerns that ceftriaxone-resistant gonorrhea might soon spread globally, which would make gonorrhea much more difficult to treat and possibly untreatable. In the study, Nicholas and colleagues, collaborating with the laboratory of Ann E. Jerse, PhD, at the Pentagon's Uniformed Services University in Maryland, showed first that the ceftriaxone-resisting mutations in HO41 and F89 come with a "fitness cost" for the bacterium. In other words, the mutations dramatically impair the bacteria's growth rate. But then the scientists infected mice with an equal mixture of the non-resistant reference strain and the ceftriaxone-resistant, growth-impaired strain. Here's the bad news: Nicholas and colleagues found that some resistant strains quickly developed much higher growth rates and even began to out-compete the fast-growing reference strain. "That made us suspect that these bacteria had acquired 'compensatory' mutations that improved their growth rate despite the growth-slowing effect of the resistance mutations," Nicholas said. But in an initial set of experiments, Nicholas and colleagues zeroed in on one of these mutations that affects a bacterial enzyme called AcnB, known to play an important role in the bacterial energy-production that fuels bacterial growth. The scientists found that the mutant form of the enzyme not only alters N. gonorrhoeae's energy metabolism but also causes extensive changes in the expression of bacterial genes, effectively switching many off and many others on. "AcnB may have yet-undiscovered functions – beyond its role in energy metabolism – that explain the fitness advantage the enzyme confers when mutated," Nicholas said.